Our QuickBooks Bookkeeping Services helps expanding businesses get the most out of their QuickBooks accounting systems. Here at DL & Associates, we take our QuickBooks bookkeeping services to the next level with our progressive knowledge and experience implementing QuickBooks for thousands of businesses. This experience allows us to have a much more in-depth understanding of QuickBooks versus your average bookkeeper. Our expertise combines our accounting background with our technical experience background, to bring you a streamlined process of an efficient accounting system and productive workflow. Listed below are our available QuickBooks bookkeeping services. Contact us today for a free consultation. DL & Associates are QuickBooks Experts located in the Chicago area and serve over 100+ industries throughout the United States. Beyond all of our employees speaking English, we are proud to be a diverse group of QuickBooks Experts that speak multiple different languages. Our American-based team thoroughly understands American taxes, economics, and supply chains. 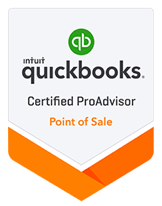 Beyond that, our team has achieved ProAdvisor certifications from Intuit for QuickBooks and related products, plus an extensive training process in order for us to support you and your growing business.